Palmistry is an ancient art of characterizing and fortune telling through the reading of palm. Palm reader will look closely at the subject’s palm and interpret the future and past based on the lines and shapes they find in the subject’s palm. In general, there are 3 major lines that intersect on most palms, which are commonly called the Heart Line, Life Line, the Head Line. Supposedly, these three lines give the fortune-teller the most information about your lifestyle and future. For some people, the Life, Heart, and head lines intersect in a very specific way, and form a letter “M” in the middle of the hand. Not all people have such a defined marking, it’s even kind of rare, and those who do have one are said to be special. An “M” might appear on one or both hands. 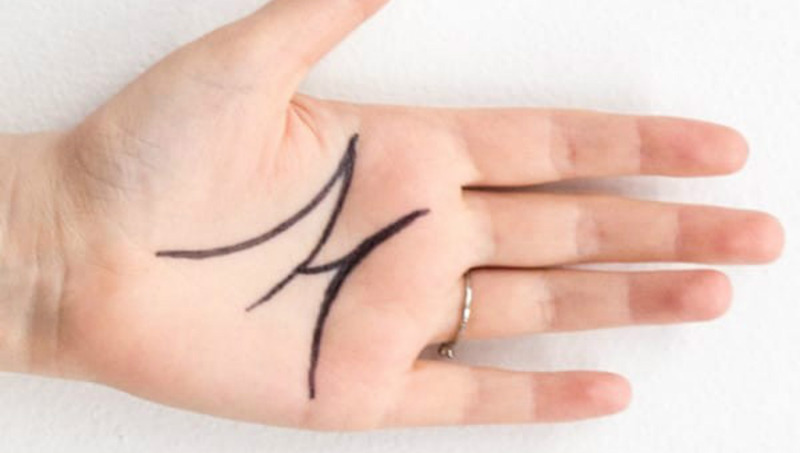 It’s thought that those who have the M shape on hand will make a great fortune in their lifetime, and will reach a position of very high status in society. They are self-motivaters and have strong self-discipline, and are therefore more likely to be succeed in their careers. They’re also supposed to be excellent judges of character. Those that have an “M” on the hand might be attracted to careers in journalism, writing or education. To find out whether you have an “M,” you need to first look for your Life Line. It starts from the palm edge between the thumb and forefinger and extends to the base of the thumb. This line predicts your health and longevity, and also might show the trajectory of your future. Next, find your Head Line. This line starts from the palm edge between the thumb and forefinger, cuts across the middle of the palm, and may look straight or be slightly curved. This line indicates how you make decisions, and what kind of willpower you have. Heart line starts between the index and middle finger, and curves down to end right under your pinky. This line describes your relationships and family life. Finally, you will need to look for a very small and rare line, called the Fate line, or the Saturn Line. For some it’s just a small crease, for others it may stretch all the way from the base of the palm towards the base of the middle finger. Not many people have this line, which is part of the reason the “M” is so rare. This line is also called as the career line as it mainly reflects the fortune of one’s career or job. Four lines link up in the shape of an “M” as demonstrated above. When your Heart, Head, Life and Fate goes together, you can rich the top of everything. That’s why palmists say M in Palm means you are very special.